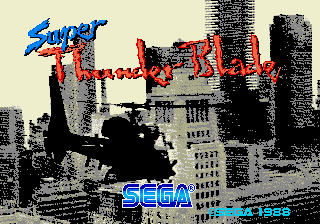 Super Thunder Blade (スーパーサンダーブレード) is a shooter for the Sega Mega Drive console published by Sega. It was one of two launch titles for the console in Japan (the other being Space Harrier II) and is a follow-up to the arcade game Thunder Blade. 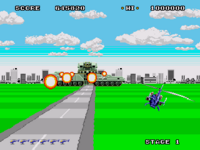 As in its predecessor, the player takes control of an helicopter which is used to attack a group of guerrillas. The helicopter itself uses guns and missiles ( and , respectively), and can also air brake (hold ). 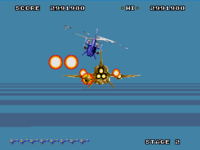 A distinctive feature that also appears in the arcade game is the use of different viewpoints during the entire game; during normal gameplay and when fighting sub-bosses, the game utilizes a third-person perspective from behind the helicopter, similar to Space Harrier, but the camera changes to a top-down perspective when fighting bosses. Stage 1 takes place in a straight-line city environment, with tanks on the streets and planes flying overhead. 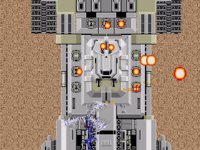 After a halt, the stage's mid-level boss, an oversized tank, appears; destroy the turrets on its sides and main gun to clear it. From there, the stage switches to an overhead perspective as it flies over an aircraft carrier. Avoid the cannons on the carrier's floor and destroy the grounded planes for more points. Stage 2 is located in a mountainous area with wooded landscapes. One of the major features of the level is a stone structure with two holes (presumably for the tanks) cut out of it; the player must navigate their way through these openings. These openings fly into caves with pillars, stalagmites and stalactites, which must be avoided. 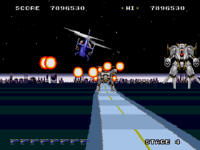 The mid-boss for this stage is helicopter which fires from its wings, but in the middle, shoots missiles. Destroy all three firing areas to proceed. The overhead boss of the level is a massive tank. It fires from its cannons in the middle. Move to the near-ends of the right and left of the screen while shooting to take out any cannons and avoid fire. 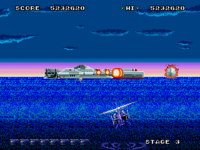 Stage 3 takes place on the seas with battleships and helicopters, which departs from the Stage 3 of Thunder Blade. The battleships are large but can be out-maneuvered easily. During the now-familiar pause in action, the mini boss will show his ugly head. Watch out for the chain of fire as it emerges from the distance. 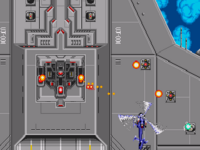 An oversized stealth flyer serves as the overhead boss for this level and aside from the cannon fire, it shoots out green balls of pain. Stage 4 is similar to Stage 1, though it takes place at night and the player moves at a slightly faster pace than before. In addition, the roads now have horizontal barriers in them that need to be flown over, under or through a gap between two. The midbosses are two robotic vehicles; it is advised to concentrate on dodging their attacks versus an outright assault. 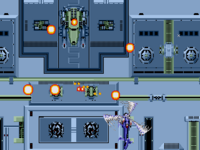 The final overhead area is a military base, and the final boss is a large cannon located in the middle of the base. Maneater Sub-Commander (TM-91B2) in western manual or MANEATER [TM-91B2] in japanese manual. Exclusive to Super Thunder Blade. A large tank with three missile launchers and a High-Power Mason Cannon. Easy to avoid by circle motion. Seaminer Commander (CVA-65) in western manual or SEAMINER [CVA-65] in japanese manual. It's actually a different kind of ship than the one in Thunder Blade, being aircraft carrier. Thus much wider, carries aircraft and missile launcher are placed on the sides. Fujii Sub-Commander (TU-027) in western manual or FUJII-027 [Tu-027D] in japanese manual. Exclusive to Super Thunder Blade. Attack aircraft. 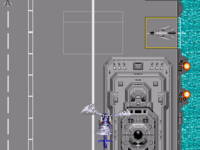 Hovers in front of player and shoots at him with missiles out of rear. May hit player while entering the screen despite doing circle motion. Land-Buster Commander (TFA-001A) in western manual or LAND-BUSTER [TFA-001A] in japanese manual. Huge strategic tank with nuclear engine. Somewhat different from Thunder Blade counterpart including missile launchers placement. Aqua-Lyzer Sub-Commander (SSA-01N) in western manual or AQUA-LYZER [SSA-01N] in japanese manual. Exclusive to Super Thunder Blade. Nuclear submarine that arrives from underwater. Circle motions still work against it. U-JAC-001 Commander in western manual or U-JAC-001 [SRS-UJ-001] in japanese manual. Space aircraft. Somewhat different from Thunder Blade counterpart in missile launchers placement. Sigma-01 Sub-Commander (S-01) and Sigma-02 Sub-Commander (S-02) in western manual or SIGMA-01 [Σ-01] and SIGMA-02 [Σ-02] in japanese manual. Exclusive to Super Thunder Blade. 25 feet of mechanical armor for infantry, aka mechs. Sigma-01 will stand and shoot at you from a single spot while Sigma-02 hovers around and shoots as well, the latter usually taking longer to defeat. There are chances that he will hit player despite the circle motion. Simply called Guerilla Basement in western manual. Exclusive to Super Thunder Blade. A top-down perspective boss zone that replaces behind-the-view perspective guerilla base boss fight in Thunder Blade. The only top-down perspective boss where it's mandatory to destroy a certain target. Make use of air brakes to slowly move backward and not fly past the target. It was released for the Virtual Console on September 17, 2007. It was also included in the Sega Mega Drive Collection for PlayStation 2 and PlayStation Portable in 2007 and in Sega Mega Drive Ultimate Collection for Xbox 360 and PlayStation 3. The Mega Drive programmers' solution to the scaling in the overhead stages of Thunder Blade was to simply cut them out completely. Instead, each stage starts off in the over-the-shoulder segment. To make up for this, these stages now have a new mid-boss, similar to the one fought at the end of the arcade version. After defeating this, the helicopter goes into an overhead view, but there's no scaling at all (which makes sense, as players couldn't change altitude in these scenes either.) These play out pretty much the same as the arcade game. Once again, there are only four stages, with the first, second and fourth being roughly identical to the arcade game, and the third being a brand new level that takes place over the ocean. There's also a new final boss, fought in the overhead perspective. Main article: Super Thunder Blade/Magazine articles.